We carry a wide variety of brands of engineered wood including Boise Cascade, Louisiana-Pacific, Parallam, TimberStrand, and Trus Joist. These brands produce some of the best engineered wood that is currently on the market. 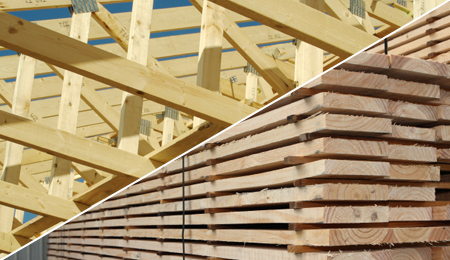 From glulam to LVL to particle board, Lampert Lumber has all of the different kinds of engineered wood that you will need to complete every part of your construction, remodeling or any type of home improvement project. In the 1940’s, during war times, manufacturers needed to create a wood product that used parts of the wood that originally would not be used. From this idea, engineered wood products were created. Engineered wood created huge innovations in wood. People could create wood products that would meet building specifications. It was lighter and could be engineered for specific purposes. Engineered wood is more environmentally friendly. Because more products can be made, very little of the tree is ever wasted. Engineered wood can be used for beams and wall construction, subfloors, and roofing. People often use particle board for furniture construction and other different do-it-yourself projects. Talk to our experts so that we can ensure that you get the best type of engineered wood for your needs.Lampert Lumber carries many different brands and types of engineered wood. Engineered wood can be used for any part of the construction process. When you are looking for high quality engineered wood, come into Lampert Lumber.